What is the Transition 2 Life (T2L) Curriculum? T2L is a self-directed program providing high school students with the skills they need to transition into adulthood and includes the curriculum content you need to meet federal mandates. The program is print-friendly, independent and self-paced. Teachers and parents have the option of using the program as a one year curriculum or as stand-alone units to meet your annual IEP transition goals over the three-year transition period. The units and suggested resources including transcripts, IDEA laws, IEP's, voter registration cards, ATM cards, etc., provide students with an individual resource book that will guide them through college, employment and young-adulthood; all while meeting federal standards for transition services. Parent letters, easy grading system and pre-written ITP goals provide you with verification and optimal accountability. For further information, please contact the author through this site, or visit our Teachers Pay Teachers content page. 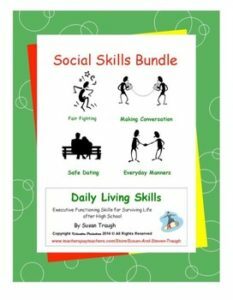 The Daily Living Skills Complete Bundle Pack contains 34 units that are designed for mild-to-moderately affected special needs high school students and young adults. 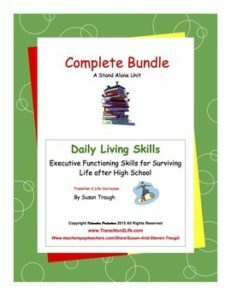 In addition, this bundle now includes the Teacher's Manual with information on setting up and organizing the program, class grading sheets, and ITP goals for every workbook. For Sale on Teachers Pay Teachers. 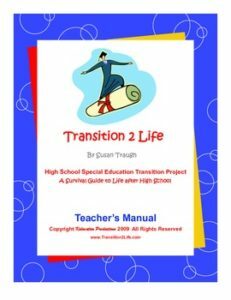 Transition 2 Life (T2L) is a self-directed program providing mild- to moderately-affected special needs students with the skills they need to transition into adulthood and you the curriculum you need to meet federal mandates and Indicator 13 requirements. This 175-page curriculum can be used to meet transition goals during an intensive semester, during the senior year, or throughout the high school years. It has been used with students as young as fourteen and into the middle twenties with positive results. To learn more about the author of this transition curriculum, visit her website using the button to the right.